I’ve been pulling my hair out this week. Last week my gut was churning with nerves. Butterflies and hair-pulling do not make for restful sleep patterns. The thing is, we’re moving. Leaving our beloved neighbourhood that we’ve watched grow and evolve for a neighbourhood 10 block east. We’re still in walking & biking distance to all the things we love, but we’ve got the benefit of discovering a whole new neighbourhood too. Actually, that’s not quite right since the ‘hood we’re moving to was the first place I lived when I moved to Vancouver and where I spent all my time before settling into Strathcona. It’s a good thing. There are great markets nearby, lots of shops and restaurants and we’ll be on a quiet street (one of Vancouver’s last remaining streets to have cobblestones from where Vancouver’s historic streetcars used to tread, in fact) with a view of the Port and the North Shore mountains. And there will be lots of space, light and windows. No, there isn’t a window in the kitchen or more counter space (but that’s what future renos are for), but it’s an inspiring space with vaulted ceilings. And a dishwasher. A dishwasher!!! Yes, I’m excited and thrilled and nervous with all the changes taking place. But before I start freaking myself out with talk of moving and boxes and upheaval, let’s talk about soup. I get that on first glance this soup might be unappealing. First of all, it’s green which could set some people on edge but not me. Somehow this soup rose above all other broccoli soups I’ve had and I can only credit that to the addition of spinach. The texture of the thing was voluminous and light which seems weird to say about a soup, but trust me when I tell you this: this soup bloomed in my bowl. I dunno if it was a mind trick or what, but it was like there was some kind of magic awesomeness involved that made this soup seem almost fluffy and creamy and perfect without any addition of cream or milk. So what I’m saying is: make this soup. As you can see, I nearly licked the bowl clean. And because we’re nearing St. Patrick’s Day, serve it with a loaf of Irish Soda Bread because homemade bread (especially an easy one like this) always trumps crackers. And go make a whiskey oat cake for dessert to get into the spirit of things – saving the leftovers for breakfast. elsewhere: Need a quick meal? Look no further than these fantastic garlic-ginger noodles. They are addictive and easy and you’ll find yourself wanting more. Repeat. In a large pot, saute the onions, garlic and celery over medium heat in the olive oil until soft. Sprinkle in the salt, chili and herbs and stir in the potatoes and broccoli. Pour in enough stock to cover all the vegetables in the pot (don’t add in too much! ), put a lid on it, and let is simmer away until potatoes are tender. Add in the spinach and stir in the mustard. Blend well using an immersion blender or pour soup in batches into a blender to get it very smooth. Stir in the cheese and blend well. If you find your soup is too thick, add in more stock or add in a bit of milk. Makes 4 large portions. Good luck with the move! I’m definitely marking this for future cooking. 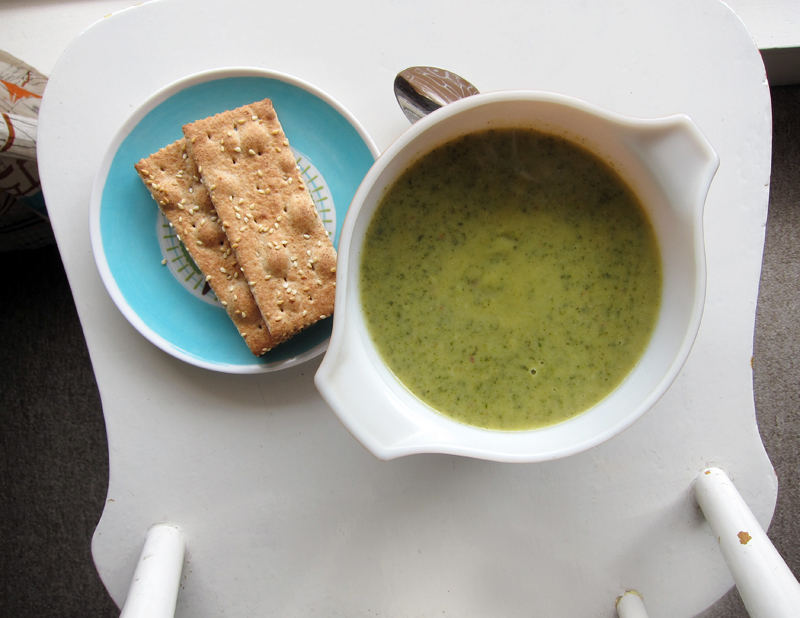 I love a good broccoli soup and I’ve been trying to get as much green in as possible lately. That sounds like a fabulous meal. I will be trying this soup – the addition of spinach has me sold. Best wishes for your move! Cobblestones, oh my! From the sound of it, your next home and this soup both sound voluminous and light. All too often broccoli stems are relegated to compost bins or the rubbish. Glad to see them incorporated into this pot of spice and other yummy green things. I’m fairly certain that the only thing that could get me through the nervousness of moving…is soup. And this one sounds crazy comforting and delicious! Broccoli, cheese and potato…what more could you want? Good luck with everything! I love soup, and this sounds especially nice! I almost always have all these ingredients on hand, like right now a bowl of leftover steamed broccoli that needed some inspiration. Think of moving as a wonderful, purging event that allows you to take stock of what really matters. I just moved after 18 years in the same place, life is better now without all that junk I had accumulated. Yay, thanks Rachel – I’ll need all the luck I can get. I hate moving (does anyone love it?). Thanks Amanda, the spinach is key here! Extra vitamins too. Thanks Joanne for your kind words. Piper, I like how you think. Purging – there will be a lot of that. Glad to hear your move was restorative and I’m going to try to think a bit more like you in that regard. Thank you. I made this, and we couldn’t stop eating it either. Some of your flavors combinations are really snappy, like dijon and cheddar, thyme and red pepper flakes. Even with a “box” of Trader Joes chicken stock, this tasted like something from a fine little bistro. Best wishes on the new digs. Don’t make your friends move your heavy furniture, and don’t thank them with pizza! I helped a buddy move last year, and he give me a 1982 Chateau Margeaux, so there’s your benchmark. Your new place sounds incredible….vaulted ceilings, bigs windows, lots of light!! And you’ve got a dishwasher too! I’m probably the only person I know without one now…boo! haha! This soup may be green but it sure is mean! Scrolling down the list of ingredients, I see quite the eclectic mix….cheese, mustard, 4 cloves of garlic…hello!!! Hope you have a smooth move and cozy into your new place. Congratulations on the move! 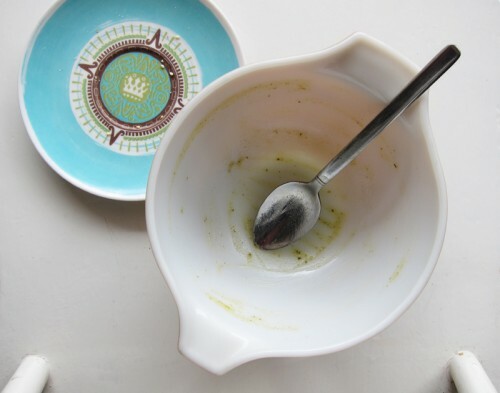 I love the look of your soup, so green, I find that sometimes these green soups can lose that fresh green colour and get a little greyish…not so vibrant. But yours looks great. Yum! Best of luck to you on your move! I hope it is everything you are hoping for! This soup looks fantastic. Coincidentally, I just tried someone’s spinach soup recently and loved it. I never got around to asking for the recipe, but this one looks and sounds similar. Thanks! Moving is such an exciting/terrifying experience, but in the end, so worth the new experiences. Your new hood sounds gorgeous – cobblestones – awesome! I can never get too much of broccoli soup. It’s magical stuff. Thanks so much Lucy, I’m pretty excited/terrified about the whole thing! Thank you, Joanne. No dishwasher? I figured that a homeowner would put one in asap! I haven’t used a dishwasher in forever, so I’m really, really thrilled about it. I’ve never had a home with one, so we’re super excited. Emily Lynne, thank you! This is a wonderful soup and thanks for the luck, we’ll need it for sure. Agreed, thanks Renee. And give this soup a go, it’s very worthy! kickpleat, there’s no room in the kitchen for a dishwasher without remodeling the entire space. Kitchen renos are the most expensive renos you’ll ever have to do. It’s just not going to happen. I actually had a dishwasher in my previous rental house and I loved it. I didn’t grow up in a house with a dishwasher so I had no idea what I was missing until I had one and now that I know, I’m not a happy camper. Joanne, Yes to all those things!!! Aw thank you so much Koren for the nomination 🙂 Yay!!! Good luck with the move!! Hope it all goes smoothly. 🙂 I love a green soup and love broccoli so this sounds delicious to me. 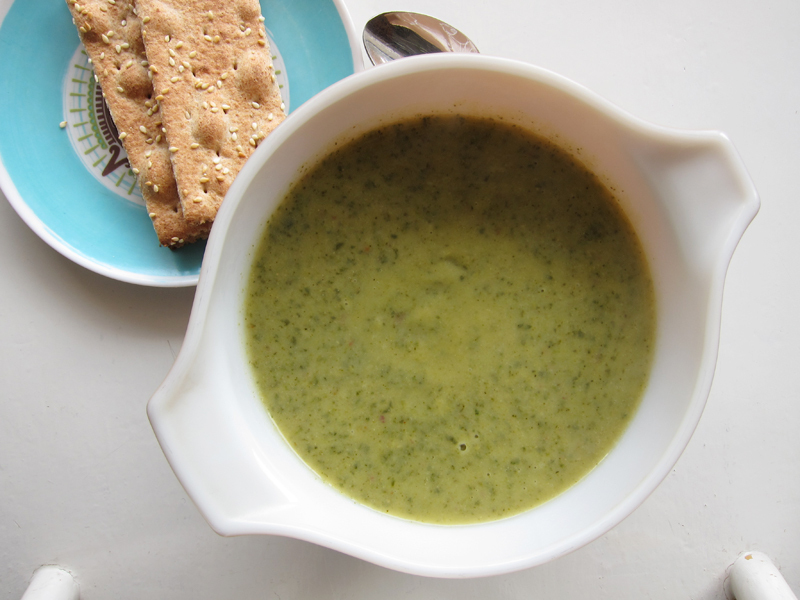 This “broccoli spinach soup” recipe is exactly what I need to make for my hubby right now. He is a bit under the weather and I’m sure this will make him feel loads better. After all, yesterday, I made him some of my good old fashioned chicken noodle soup and he started feeling a bit better just from that. Thanks Grandma Kat – this is a cure for what ails, I’m sure. Robert F, thank you for being an ELS cheerleader! You’re too kind and your book club sounds awesome. Glad it was a hit among friends. This looks great, and perfect for a breezy summer evening. I can’t wait to try it! How many servings does this recipe make? Danielle, I’d say it makes about 4 servings! It’s a good soup, I hope you enjoy it! Just found your blog through gojee.com. This soup is amazing! My wife and I have been eating it all week. I was surprised at how filling it was. It’s now on our “regular rotation” list. Thank you! AMAZING!!! Thanks! I will definitely be searching your we site for other yummy recipes!! !